With these words in l831, poet, novelist and dramatists VICTOR HUGO (l802-l885) known as “The most important of the French Romantic Writers,” began his historical novel Notre Dame de Paris (known in English as The Hunchback of Notre Dame) explaining, in a few paragraphs later, that what had set in motion all the population of Paris on that day, was the double solemnity, of The Epiphany and The Festival of Fools, the only day in Paris, when the gypsies could come to the city and sing and dance in the courtyard of Notre Dame. And it is with the audience watching the gypsies dancing and singing the “Bells of Notre Dame” during The Fools festival, that the musical “THE HUNCHBACK OF NOTRE DAME” (based on VICTOR HUGO’s story) begins. And what an awesome story it is. Instead of a young handsome prince, HUGO’s protagonist in his novel is Quasimodo (DAVID MISTER) a deaf bowlegged hunchback, who as a baby, and after both his parents had died, was given to Archdeacon Frollo (JAY STEELE) his uncle, who called him a “monster” when he first saw it, and who probably ashamed of the child and not wanted people to see him, hid it in the Belfry of the Church of Notre Dame in Paris, and actually made him deaf, by making him ring the bells. He taught him religion, gave him communion every day and fed him, but this "man of God" never showed love or compassion to the son of his younger brother. He even hated the poor man for being "ugly- looking" and the son of a gypsy. And one day, during The Fools Festival, when Quasimodo was getting a glimpse at the roofs of the city of Paris from the belfry of Notre Dame. where the bells he rang were located, he got a glance at Esmeralda (JENNIFER MAGGIO) one of the dancing gypsies, and encouraged by the statues in the church, (who were the only ones who“talked” with him) he ventured outside the church and joined the festivities. It was a bad mistake. He was not only mocked by the people, but hit in the face with tomatoes and humiliated by all the gypsies, except one: Esmeralda. Her kindness, woke up the "love" inside the heart of the deformed man. 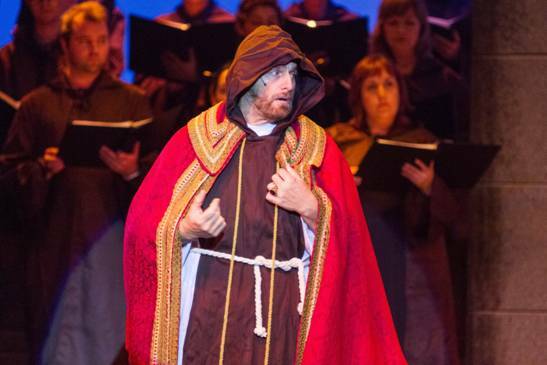 JAY STEELE as Archdeacon Frollo with some members of the 33 voice choir. As presented on Sunday’s May 20th matinee by the cast of the SOUTH BAY MUSICAL THEATRE in Saratoga, California, (directed by DAVE LEON in his Directorial debut) The production was seamless. Every one of VICTOR HUGO’s characters in the musical version of THE HUNCHBACK of NOTRE DAME, (which takes place in Paris, France in l492) came to life on the stage. The voices have quality. The singers enunciated their lyrics well. All their performances were realistic. MISTER may have needed to curb his legs when walking, to look bowlegged, but his performance as Quasimodo was excellent. His character was able to show the audience a combination of his fear and his courage, with his courage triumphing at the end. Courage was also shown by Esmeralda (MAGGIO) when she not only defends the “monster” from the mocking people but took him back home to the church. In the musical, as in the novel Esmeralda is beautiful as a person. She is compassionate and full of love. MAGGIO was able to convey both Esmeralda's qualities to the audience in her acting. We can add that the actress is a marvelous dancer and has a beautiful timbre of voice. As Archdeacon Frollo. STEELE had a difficult dual role to play on the stage: The role of Frollo the man, and the role of Frollo the servant of God. As written in the libretto's dialogue, the “Archdeacon” part of never showing Quasimodo any compassion, was played convincingly by STEELE. His performance in his role of "Frollo the a man” however, needed to show the audience his suppressed passion (lust for the woman) We ought to remember that the actor playing the role needs to make the audience believe that the motivation for what he did to the gypsy was his passion for her. When the woman he was lusting for, as a man, rejected him, she wounded his pride "as a man" so deeply that he had to destroy her. STEVE ALLHOFF’s role as Captain Phebus was credible in every aspect, and ALEA SELBURN as Clopin Truollefou was perfect. Magnificent-sounding in this production was the mixed choir, (DIANE MILO vocal director) the gypsies chorus and and the orchestra. Watching THE HUNCHBACK of NOTRE DAME, we need to remember that the reason why this story still has meaning to modern audiences is that it was written to condemn a Medieval Paris society during the Kingdom of LUIS XI, where those with the money and the power used them to humiliate the poor, the destitute and the gypsies for no other reason than being poor or destitute of a "minority" people. Tired of the abuse, VICTOR HUGO wrote his novel with the purpose to awaken the consciousness of the Parisian. Five hundred thirty six years later, things have not changed much, which is the reason why today we can still understand the injustice done to Quasimodo and Esmeralda. When it is represented on the stage, it touches the core of our hearts and it hurts. 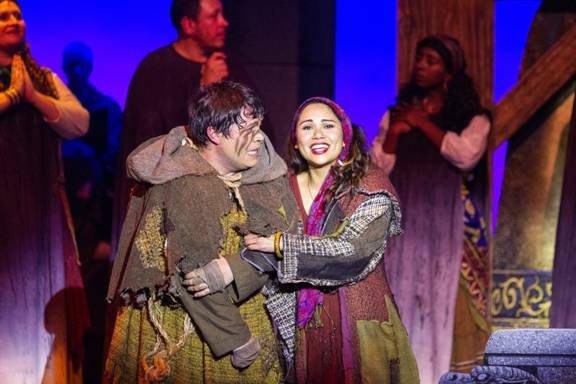 Hunchback of Notre Dame is performing at the Saratoga Civic Theater located at 13777 Fruitvale Ave, Saratoga, CA 95070. For performance dates, ticket prices, and to order tickets, please visit their website at www.southbaymt.com, or call their box office at 408-266-4734.